I really wasn't much of a pinball guy. I do remember, back in the day, coming across The Getaway: High Speed II in a bowling alley, playing a couple of games, and coming away impressed, but I was more into Sega racers as a kid. I had fun whacking the ball around, but I didn't really go in-depth, as to where things needed to go. Things changed, though, when I picked up a PlayStation Vita last year. I was looking for something to play it with, and I came across The Pinball Arcade from FarSight Studios. It was a cross-buy game, meaning that I got both Vita and PS3 versions at the same price, so the value proposition was there, and I was getting slightly bored with the games I picked up for it, so why not? That's when the addiction started. The purchase price included four tables- Black Hole, Theatre of Magic, Tales of the Arabian Nights, and Ripley's Believe It or Not. I took some time to read through each table's rule sheet, started playing... and got hooked. I downloaded all the additional tables when they became available. I slowly learned how to conquer The Twilight Zone, one of the most complex pinball games ever made. I put my balls into Rudy's mouth (wait, that came out wrong) in Funhouse. I got hooked into virtual pinball, found the relevant GAF thread, found a relevant fan fourm, found a great news site, and just dove in. I learned strategy, tips, skills, anything pinball related. I started to learn about the greats through the IPDB. I even contributed to the successful Kickstarter to get Terminator 2: Judgment Day into the game. And frankly, it was all worth it to learn how to play pinball. I know what lane changes do, how to get multiball, how to play games from the '70s and early '80s, figured out all the nuances thanks to the goal lists, and got on the path of becoming a pinball wizard. I'm not there yet, but I can have reasonable games on real-life examples of Twilight Zone now. 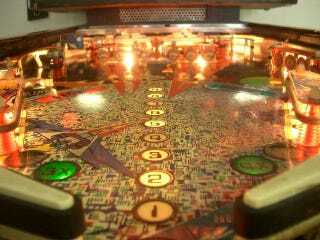 I really think that The Pinball Arcade deserves to be a Last-Gen Hero because of how it awakened my skills at pinball and helped me to better appreciate the form. Now, if it can only get The Getaway, along with the biggest selling solid-state pinball game ever, it'll be perfect.